Waves of Technology Change: Grab Your Surfboard or Life Jacket? 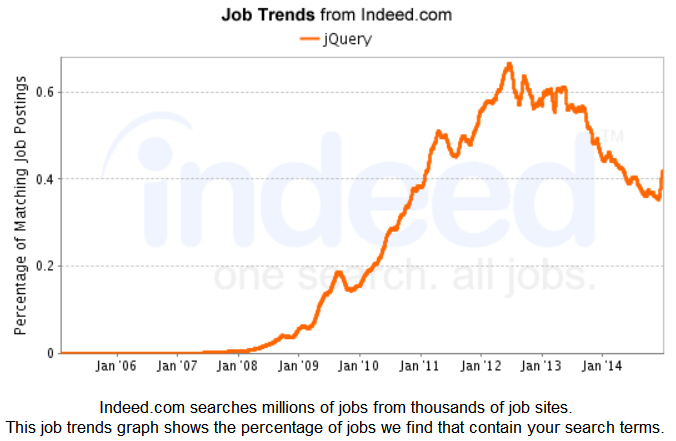 Over the past 5 years I’ve followed the Indeed Top Job Trends, informally checking them several times a year. They have provided me with insight on the current software and computing technology changes. 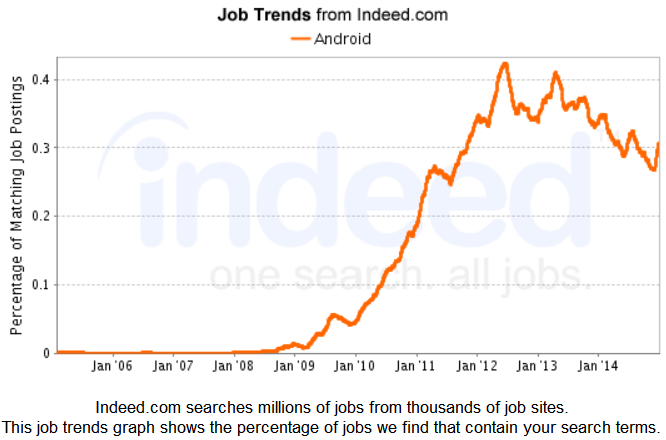 You can see the job trends for yourself at http://www.indeed.com/jobtrends. 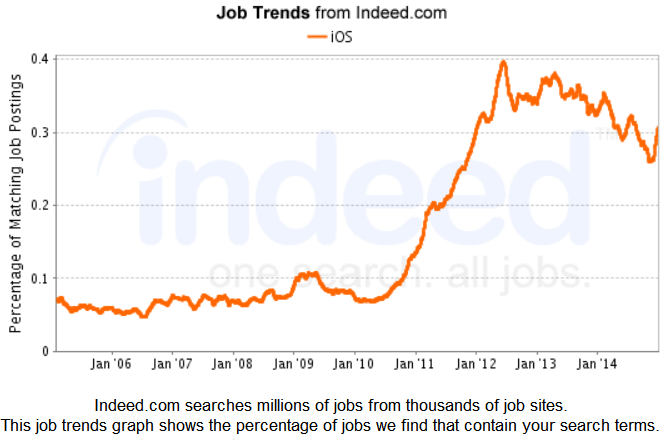 These charts show the relative demand in the job market for various technological job skill keywords in Indeed’s job ads. In July 2013 I posted my first article about these trends at https://dotnetsilverlightprism.wordpress.com/2013/07/27/net-single-page-applications-spa-helpful-info-sources/. Herein I use the mental model of waves of technology change washing over us, similar to the waves one sees at the beach when the surf is up. While over simplified, it is a useful model for conceptualizing of how we are impacted by multiple technology changes. Each wave of technology change proceeds at its own pace over time, yet also interacts with some or all of the other waves of technology change in process to a greater or lesser degree. Thus, the intersection of several of these waves reinforces each other, causing larger amplitude of change, which has more impact and disruption of the status quo. Please understand my goal with this mental model is pragmatic. I am not using scientific techniques to clearly identify what is a wave and what is not. Look at the charts below and you’ll see the waves. Rather, my goal is to use the wave metaphor to 1) inform you of the changes taking place via charts of relevant data, and 2) to set up for subsequent blogs that deal with techniques one can use to thrive amidst multiple big waves. Such disruptions increase the uncertainty and risk of making business and technology decisions. Understanding these dynamics is part of the answer to managing risk and uncertainty. And these uncertain times of change will be with us for a number of years to come, as the length of the below trend lines portend. This short video clip summarizes our predicament — one wave after another https://www.youtube.com/watch?v=yK0hIWmwtd8 . Should I be reaching for my surfboard or my life jacket? To effectively deal with such changes I support finding ways to manage risk, but also to exploit some of the technology changes at an acceptable level of risk. In future blogs I’ll state more specifically how to do this. It involves education, a willingness to embrace change, a planned approach to development, driving out unknowns and risks earlier rather than encountering them too late, plus the design techniques of service orientation, decoupling things so they can vary independently, and encapsulation of areas of significant change. This approach provides both life jackets and surfboards. These techniques offer a significant source of stability in uncertain times, despite the many waves of change washing over us. Mini-computers their software displacing mainframes in the 1970s. The rise of PC’s, desktop software, and workstations in the 1980s. The rise of the World Wide Web in the 1990s. The rise of the .NET and Java frameworks and their support of widespread distributed computing in the 2000s. New Web wave – New in the “teens”. 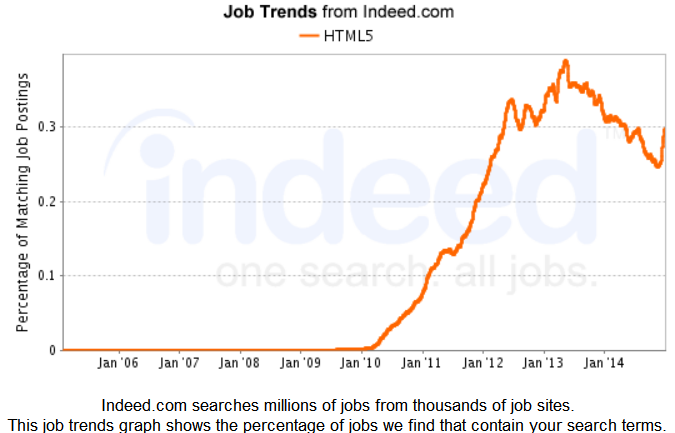 HTML5 and jQuery continuing and accelerating the 1990’s rise of the Web. Mobile wave — New in the “teens”. Big Data wave – New in the “teens”. Cloud wave – New in the “teens”. Internet-of-Things (IoT) wave – New in the “teens”? There could be other waves as well, like the Distributed Computing wave which is still at work and partially included in the Cloud wave. However, I am limiting this list to items found in the Indeed Top 10 Trends and the Distributed Computing wave is not in it. However, I am adding the the Internet-of-Things wave since its scope and effect are so vast, perhaps larger than Mobile as it is today. I’ll have more on that topic in a subsequent blog someday. Wow! We now have at least 4 new big waves of technology change to deal with. Any one of the above waves is challenging for enterprises and professional developers to deal with by itself. But when a number of the waves start washing over us all at once or in rapid succession things become much more complex. Is it time to grab for your surfboard, or your life jacket? 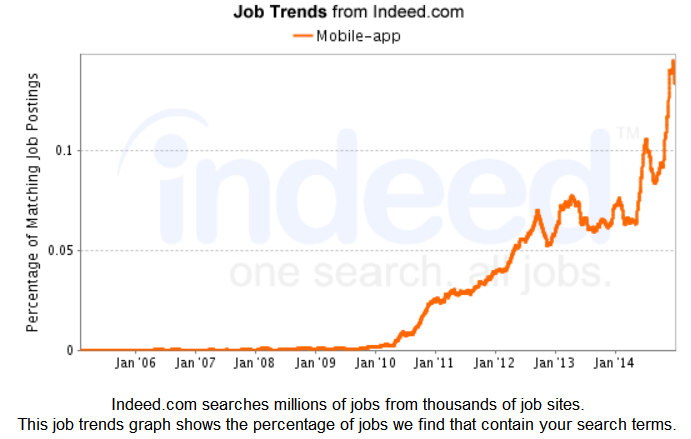 What does the Indeed job market demand data tell us about these waves of change? 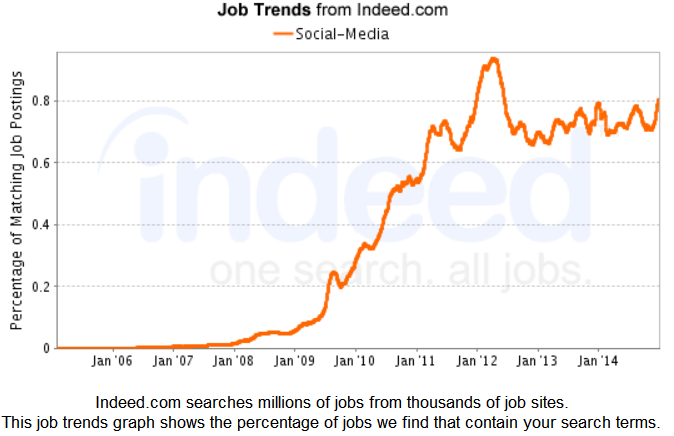 The top 10 desired job skill keywords found in the Indeed job listings are listed below. I have provided explanations of the terms that may not be commonly known by software technologists. MongoDB – A popular NoSQL database. Puppet – A Linux deployment utility. Hadoop – A Big Data analyzer, using Map Reduce algorithms and special query languages called Hive and Pig to query and analyze tons of data in parallel, often using many, many, many virtual machines to do so. PaaS – Cloud Platform-as-a-Service capabilities. MongoDB appears in both the Cloud and Big Data categories. 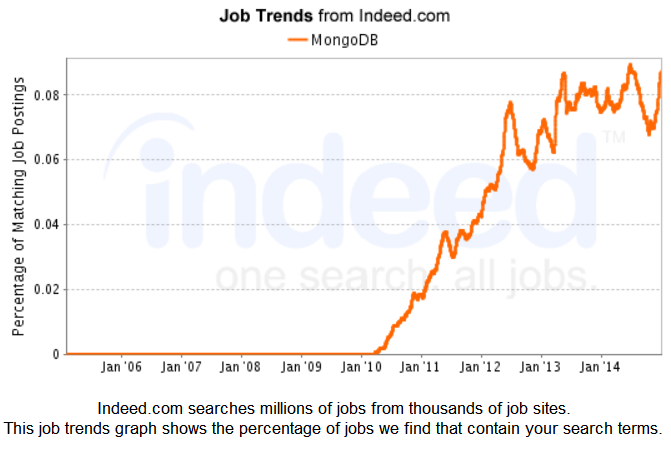 The job ads show the MongoDB technology is widely used, and may well be appropriate for other categories as well. Perhaps there is a NoSQL wave I omitted. Mobile — This wave has not yet peaked, although some sectors may have. New Web — This wave is well beyond its peak, with things returning to a new equilibrium. Big Data — This wave is continuing its advance and has probably not peaked. The new items on the list this year are PaaS and Puppet. PaaS’s presence on the list this year announces that the Cloud wave has just started to hit us. It is no longer “out there” at sea, but it is beginning to have a significant impact on the job market, and upon the technology we need to deal with in the high tech industry. Note that in a 2/9/15 Investor’s Business Daily article “Amazon Cloud Business Reigns; Google, Microsoft Make Impact” it was stated that “only 8% of the businesses worldwide that could move to the cloud have done so, says IDC”. That confirms there is a whole lot to come in the Cloud wave. I am not sure what Puppet’s presence on the list means, being unfamiliar with the details of the Linux world. Nor can I discern whether it is “wave worthy”, i.e. can a single deployment technology be considered a wave? Perhaps it is part of something else. And, there is no evidence as yet of the Internet-of-Things wave as an entity clearly visible as being separate from the Cloud wave of change, upon which IoT depends. That wave remains “out there”, looming on the horizon. Looking at the individual graphs of these technologies over time is instructive. All of the below charts show the “absolute percentage of matching” job postings containing the key word. These charts give one a sense whether a particular wave has peaked yet, or whether a wave is past its peak. If a wave has not yet peaked you can be sure the effects of that wave will continue rippling out causing continued disruptions of the status quo. After all, isn’t that what change is? Once a wave has peaked, however, the charts typically show a period of stability in market demand in a sideways consolidation. During this time the industry and consumers are establishing a new status quo. This likely takes several years. First let’s take a look at the graphs of technologies that are in strong up-trends, and thus have not peaked. I’ll deal with those in consolidation patterns later. I define a “strong up-trend” as the curve being at, or above, the obvious trend line (a straight line drawn connecting the low points of the up-trending curve). These 3 graphs say that the technology changes associated with Mobile Apps, Puppet, and the Cloud Platform-as-a-Service (PaaS) are still gaining strength and have not yet peaked, or even slowed down that much in the past FIVE years. And, both Mobile and the Cloud showed strong acceleration in 2014. These are very strong, long duration waves of change! It would be interesting to see what the strongly trending key words were in the top 20 or 30 Indeed items, rather than just the top 10, and how long those trends have been going on. 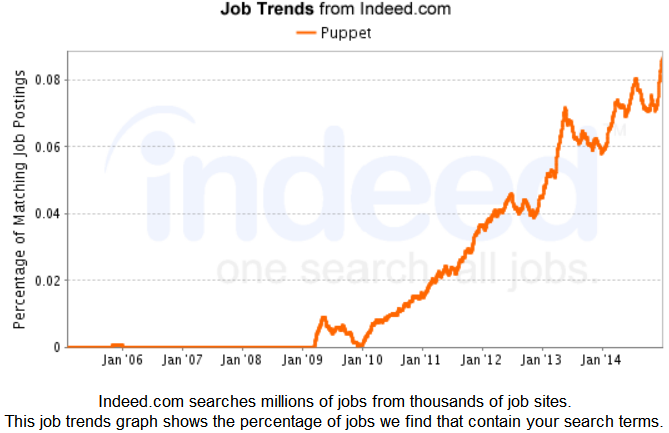 That data is not readily available from Indeed. What about the technology change waves that are not strongly trending right now, but in consolidation patterns? 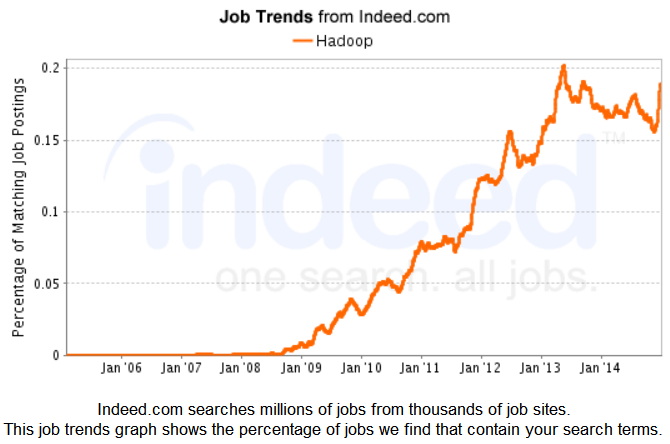 First let’s look at the items whose curves, below, are in the shortest consolidation patterns, having peaked roughly in 2013 – Hadoop, MongoDB, and HTML5. All have been in sideways consolidation patterns for roughly 2 years and have been strongly trending for 5 to 6 years. The 2 Big Data items may currently be “breaking out” of the consolidations to resume their up trends. That will become evident in 2015. This says the Big Data wave may not have peaked yet. I’ll bet it has not, but time will tell. However, the demand for HTML5 may well have peaked since the consolidation is much deeper than either of the Big Data items. Below, take a look at the items in the longest consolidation patterns, or even in possible down trends. All of the following technology change waves peaked in 2012. And, their trend durations were 4 to 6 years, with the exception of iOS which had the shortest trend duration of 2 and a half years since the iPad’s introduction happened in 2010. Note the difference between the Mobile App curve above in the strong trend section and the below iOS and Android curves in 3 year consolidations. The Mobile App category is picking up some things that are not iOS and Android. Maybe Xamarin? Try an Indeed search for Xamarin in the Trends page and you’ll see an extremely strong uptrend for the past 2 years (not shown). That is likely where the bulk of disruption is in the Mobile wave at this time, although it bears further investigation. The wave in jQuery has peaked. And the trend in Social-Media has plateaued, if not peaked. So there you have my overview of the waves of technology change we are dealing with right now. I hope this will provide you some perspective that aids you in your decision making this year. Now about grabbing a surfboard (so you can attempt to reap gains from a wave by riding it) or your life jacket (so you can manage the risk of the disruptions): I say, use both! After all the dedicated big wave surfers that ride huge 40+ foot high waves at Maui’s Jaws (aka Peahi) typically use an inflatable life jacket when they surf those giants since it’s a game of survival in that environment. And so is it also a game of survival for many businesses in these times of great change, having to replace or refurbish old software systems in a time of great technological uncertainty. It is easy to make mistakes and waste time and money in such an uncertain, yet competitive, environment. Using a few time proven principles of software engineering goes a long way in preventing such mistakes.